One of the most valuable habits I have cultivated as a teacher for 35-plus years is listening to my students in the spaces before and after class time. This is a kind of professional eavesdropping not intended to pry on my students personally but to hear who they are as students when they are relaxed and speaking with each other (not under the teacher’s gaze). Before class during the start of this semester, I saw one of my students diligently reading and then talking with other students near her. She was reading “They Say/ I Say” for her first-year writing (FYW) seminar. When I asked her about the text and the course, a floodgate opened; she and other students in the class truly dislike the text and the course using it. Since I teach two sections of FYW each fall, and held a small administrative role for a few years over our retooled first-year seminar program, I often ask students to talk to me about their FYW experiences. Too often, I continue to hear that our students are in seminars that put writing instruction secondary, although writing is the primary purpose of the courses. First-year writing for many students remains drudgery, repeating the experiences they have had in high school and throughout their K-12 courses. As a teacher of writing, first at the secondary level for 18 years before teaching college writing currently, I have fought a long and discouraging battle against template approaches to writing instruction (typified by “They Say/I Say”), the five-paragraph essay, and rubrics. Seeking authentic practices and teaching writing as a writer have been my guiding principles, but too often, that journey has been over rocky terrain and decidedly uphill. Writing prompts, templates, and rubrics are powerful and often necessary tools for teachers of writing with little or no experiences as writers, and these artificial tools also facilitate some of the most entrenched, and worst, practices in traditional schools—grades, testing, and accountability. Fortunately, I have discovered an important and engaging (mostly virtual) colleague in the pursuit of effective and authentic writing instruction—writer, public intellectual, and teacher John Warner. 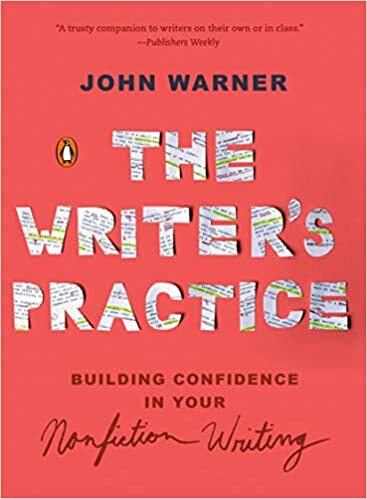 Quickly in the wake of his excellent Why They Can’t Write (see my review here), Warner now offers The Writer’s Practice: Building Confidence in Your Nonfiction Writing. In the former volume, Warner takes solid aim at the five-paragraph essay and this work appeals primarily to teachers of writing, I think. His Practice serves more as an authoritative guide for anyone who wants to be or grow as a writer. This past Friday and Saturday, I attended the annual convention of the South Carolina Council of Teachers of English (SCCTE). Throughout the sessions, keynotes, and conversations among teachers, I witnessed why Warner’s newest book is so valuable. Many who teach literacy struggle with the tension between being authoritarian and being authoritative—a foundational teaching decision emphasized in Paulo Freire’s critical pedagogy. Writing and writing instruction driven by prompts, templates, and rubrics are authoritarian, thus simultaneously inauthentic and effective for control. Writing and writing instruction driven by structure (negotiated between teachers and students) and committed to providing students with many varied opportunities to make and practice the decisions writers make are authoritative, thus authentic but prone to uncertainty and unpredictability. The authoritative teacher must have expertise and the ability to teach on the fly, regardless of the lesson plan. Formal schooling tends toward the former because of the perceived need for control. However, writing is a complex behavior, and teaching writing often requires a teacher who is also a writer, who can guide novice writers through practiced experiences. As I listened and discussed with friends and others at SCCTE, I once again recognized how many of us have failed writing instruction, allowed writing workshop and student choice to flounder because these practices have been confused with class time and student assignments devolving into unstructured and unguided license. Writing workshop and student choice, however, are not about allowing students (who have little experience or expertise as writers) to do anything they please, but about an expert teacher providing purposeful structures within which students as novices can practice, revise, and grow as writers against their rich reading lives. And thus, Warner’s Practice, which offers excellent opportunities for writers and teachers of writing to experiment with his framing in search of the practice that works best for them. The volumes sections—skills drills, analytical writing, research and argument, other writing experiences (including a broad range from jokes to thinking about sentences)—are ideal for K-12 and post-secondary writing instruction that is primarily aimed at all students (not just those who want to be writers) and seeks a variety of essay writing grounded in the academic disciplines (more so than writing fiction and poetry). Finally, a real gift of this volume is the Appendix where Warner offers some possible weekly structures for using this as a text in first-year writing. As I did with Why They Can’t Write, I highly recommend Practice, especially for those who teach writing. It is a needed and compelling argument that writing requires structure and practice, but too often is muted by prompts, templates, and rubrics that serve an authoritarian goal but not the needs of students who could be writers.